Sub-sea earthquakes cause tsunamis, a series of waves carrying a massive volume of water, which can be disastrous for low-lying coastal communities. Following the Indian Ocean tsunami in 2004, the IOC was given the responsibility of leading the implementation of tsunami warning systems, which can detect and locate subsea earthquakes within a few minutes, not only in the Indian Ocean but also in the Caribbean and the North East Atlantic, Mediterranean and Black Sea (a warning system for the Pacific was already in place) so that evacuation plans can swiftly be put into action. A network of regional tsunami watch providers will locate the epicentre of an earthquake and measure its magnitude. 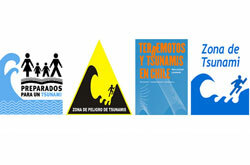 Watch providers will then assess the tsunami risk and, if necessary, issue a tsunami watch message to national authorities. Additionally a community-based programme of awareness plans will be rolled out. To measure and assess risk, centres will use seismometers to pick up tremors and movements in the Earth’s crust, tide gauges to measure changes in near-land sea level and tsunameters which are open-ocean buoys which have a pressure sensor at sea bottom for measuring waves and which, by using a surface buoy, send real-time data to watch centres via satellites. Historically the Mediterranean and North East Atlantic is one of the most tsunami prone regions in the world and the UK is working within IOC to assist in the development of a tsunami warning and mitigation system for this region. This will use seismic data anomalies as well as sea level gauges to alert national civil protection agencies to any potential threat and will be integrated, where appropriate, into other sea-level warning systems. Steady progress has been made and France, Greece, Italy Portugal and Turkey will all be operating national tsunami warning centres in the next few months. Currently, Trevor Guymer, past head of the UK IOC Office is serving as Vice-Chairperson for the North-eastern Atlantic, the Mediterranean and connected seas Tsunami Warning programme. In 2014 work was initiated to improve UK involvement in the North East Atlantic and Mediterranean Tsunami exercise. This is a training event designed to test countries’ preparedness in the event of a tsunami, which involves the simulation of the assessment of a tsunami, based on an earthquake-driven scenario followed by alert message dissemination. Previously the UK has not taken part in this exercise. As such 2015 was the first year that the UK participated. Further work has been carried out to invest in the tsunami warning system in the UK's overseas territories. Each Caribbean island needs to have a Tsunami warning contact point. In 2014 the UK facilitated the appointment of such a contact point on all of its overseas territories. Further more in 2015 the UK invested in new tide gauges around the coast of Anguilla. Tide gauges are an important component of the tsunami warning system, allowing changes in sea level, either regular or irregular in the event of a tsunami, to be detected. This information, in conjunction with knowing the epicentre of the offshore earthquake, provides an early warning of a tsunami’s approach to shore.